We’re joining dozens of local artists for Wauk The Mall: a most-unique art walk hosted by the Belvidere Discount Mall — the original “survivor mall” — to exhibit a double-feature of art, history and adventure in the lobby of a long-forgotten movie theater! For the first time in 16 years, the lobby lights and a screen will come back up at the Belvidere Cinema, an original General Cinema theater built in the booming age of the suburban shopping mall, that has remained largely unchanged since its opening in 1966. Inside, you’ll be immersed in the photography and knowledge of [jonrevProjects] – one of Chicagoland’s reputable urban explorers and lowkey local history nerds – as he takes you on a photographic journey to the the many abandoned buildings and forgotten relics found throughout Waukegan, Chicago, Milwaukee, Gary and beyond! As a bonus feature under this special setting: we’re premiering the “Cinema” series, an eight-piece print collection exploring abandoned movie theaters visited and photographed throughout the years. This will be the only night this collection is shown together and is a feature you won’t want to miss! 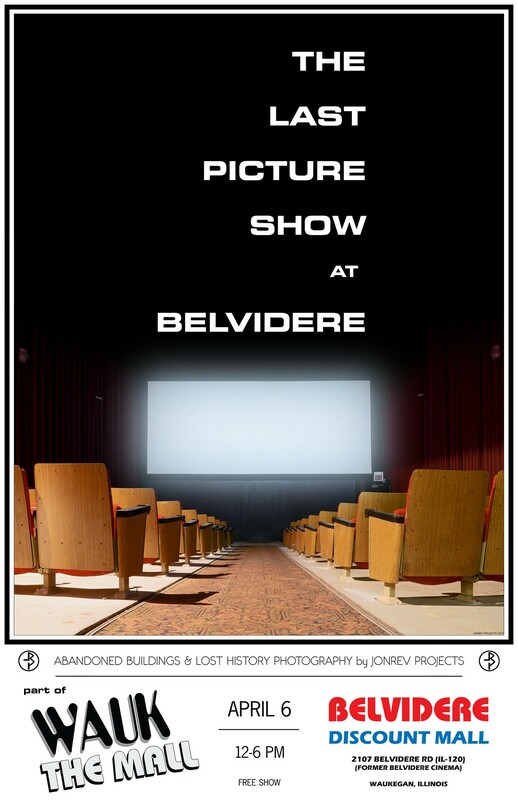 Join us at the Belvidere Cinema to revisit and reminisce! Belvidere Discount Mall is at 2107 Belvidere Rd. (IL-120) in Waukegan. 12-6pm. Free show, free parking! Prints $20-100. Cash & plastic accepted.